Edit by AngryEwok - Don't put images in your signature. That's a good idea starkid. I like the use of the cloud car pilot with the "Rykrof" head. Did you do anything else to the figure besides a head swap? It looks seamless, good job Star. Yeah I hosted it for him. Looks good. I can't wait to see what everyone else makes on this, sounds like Phruby has some good ideas. Thanks again for the link Ryan, I ordered 5 more of that figure at $2.00 each. That should keep me well stocked on those heads for a while. Maybe I should order a dozen more because you can't beat that price. How much was the shipping on 5 of them? $5.80 shipping for 5 figures. So $15.80 for 5 endor troopers with beard. The non beard version costs $8 instead of $2. I didn't know the non beard version with rarer. I was just about to buy this when I remembered that I just bought all that stuff to make casts. I think its still going to be cheaper to buy from yestertoys.com than making casts. I've boughten from them before. Good service and fast shipping. I spent $90 at Yestertoys the other day. And I bought over $100 of stuff from them at C3. They seem like good guys, and their prices are better than clearance prices at retail. Yep, $5.80 or something like that is their flat rate on shipping... I also picked up a few SAGA TIE Pilots from them for just $5.25 each. It's funny, here I am broke as hell and still buying stuff. Control. Control. You must learn control. I could use a couple of thse heads can I get in on this? Ive only got the one endor trooper, but since I was planning on making a Rykroff anyway I had every intention of sacrificing it. 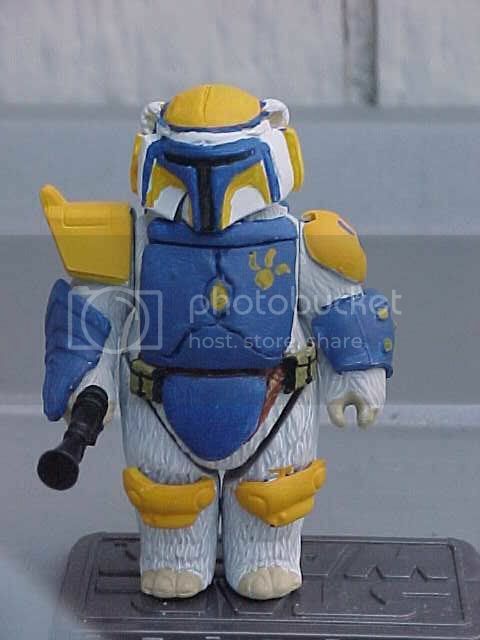 Id really like to make one in his republic officer uniform, but the bodies are hard to come by. Ok, my Rykrof is ready. That's really cool! Does the helmet fit? Either way, can we get a better shot off it? Damn, I need a digi-cam (really good, but really inexpensive... ) so I can take part in this - I have a, sort of, dark jedi Rykrof thing going on here - but the scanner won't do it justice (not that it's all that great, but still). And on a related, but separate stream of consciousness, anyone else ever have any problems with waiting 3 months for Yestertoys to deliver? That's what happened last time I ordered from them, so I'm a little weary this time around.